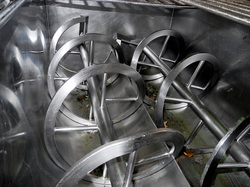 TWIN SHAFT RIBBON BLENDER, STAINLESS STEEL, approximately 30 cubic foot capacity. 37 inch wide by 60 inch long by 27 inch deep mixer vessel, with (2) 7 inch by 11 inch bottom end pneumatically operated discharge gates. Agitator ribbons are 1/2" thick by 1.5 inch wide, and run outside 2.5 inch diameter shafts. Complete with hinged top dumping grid, and (2) 3HP 208/230/460 volt 3 phase drive motors. 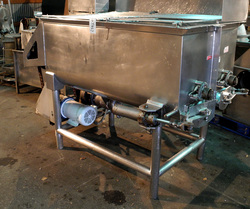 As of this writing, this twin ribbon mixer is in stock in good condition, available for timely shipment. This page contains a single entry by Michael C. Shults, Alard Equipment Corp published on August 23, 2013 4:22 PM. y1846 was the previous entry in this blog. z9536 is the next entry in this blog.